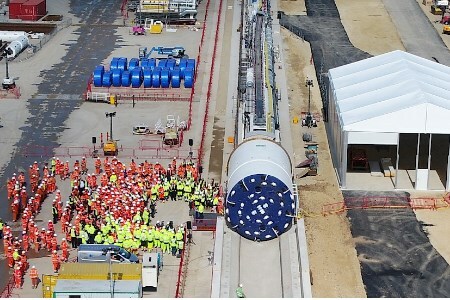 The first 1800 t tunnel boring machine that will be used to construct Sirius Minerals’ 23 mile mineral transportation tunnel from Teesside to Whitby (UK), was officially launched on 12 April at a ceremony on Wilton International in Redcar. Local schoolchildren unveiled a plaque with the name of the machine, Stella Rose, which was chosen by an online vote. Eight yearold Warren Walls, from Ings Farm Primary in Redcar, suggested the winning name, inspired by ‘Stella’ meaning ‘star’ in Latin (and ‘Sirius’ meaning ‘brightest star’), and ‘Rose’ by the famous local landmark, Roseberry Topping. The tunnel is part of the company’s multi-billion pound project to extract polyhalite, a form of natural fertilizer, from Woodsmith mine near Whitby. It will be transported on a conveyor belt along a 23 mile tunnel to Teesside, where it will be processed and shipped around the world. The mine has been designed with most of its infrastructure underground and will create over 1000 long-term jobs and support a further 1500 in the supply chain. “This project is delivering jobs and economic benefits for the area,” said Councillor Sue Jeffries, who is the patron of the tunnel, a traditional ceremonial role in the industry to oversee the welfare of all who are working underground. Tunnel contractor STRABAG, which also worked on the 35 mile Gotthard Base Tunnel under the Alps, will now push the 225 m tunnelling machine into the ground down a pre-excavated portal to bore the first of three separate tunnel drives which will make up the 23 mile tunnel. Two further machines are planned to be launched in due course from Whitby and Lockwood Beck, near Guisborough, to complete the other 15 miles of the 6 m dia. tunnel. Each TBM will operate 24 hr/d, seven days a week, lining the tunnel with a total of 150 000 concrete segments to form rings which reinforce the tunnel walls.